to Google Docs. 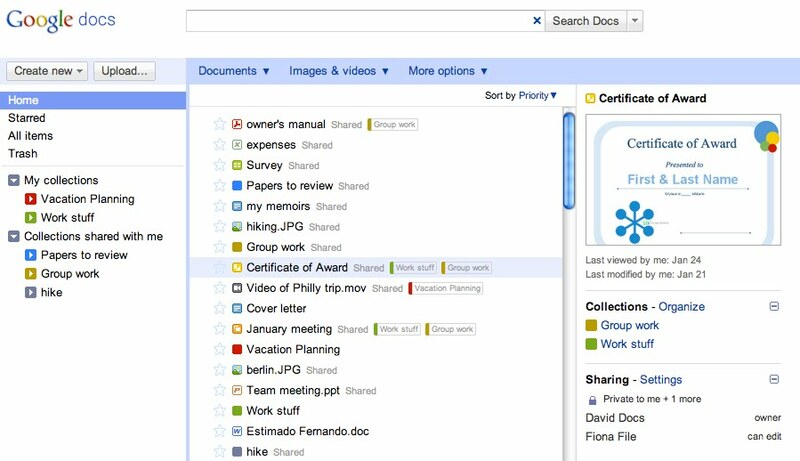 With more files and a variety of file types in one place, organizing and quickly being able to find what you need becomes even more important. As a result, we’re happy to announce that, over the next couple of days, we’ll be rolling out a refresh to the documents list, aimed to make it easier to find, explore and share all your files. We’re also rolling out big improvements to our back-end systems to make your experience in the documents list faster and smoother. Google Apps for Business customers who have the “Enable pre-release features” option selected in the control panel, and customers of all other editions will start seeing the new interface within a few days. Google Apps for Business customers without the “pre-release features” option selected won’t see this improvement for a few more weeks. More details can be found on the Google Docs blog. 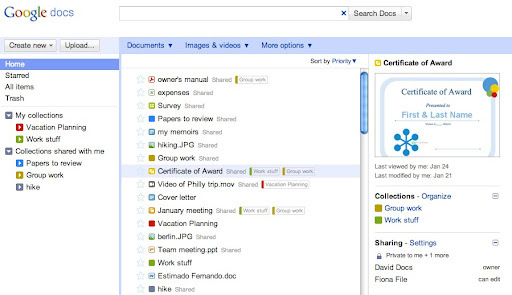 Files stored 100% on the web can be accessed from any computer or device and shared with co-workers with ease. Over the past year, many of you have been taking advantage of the ability to upload any file to Google Docs. With more files and a variety of file types in one place, organizing and quickly being able to find what you need becomes even more important. As a result, we’re happy to announce that, over the next couple of days, we’ll be rolling out a refresh to the documents list, aimed to make it easier to find, explore and share all your files. We’re also rolling out big improvements to our back-end systems to make your experience in the documents list faster and smoother. in the Google Apps Marketplace designed specifically to help schools and universities easily discover and deploy new web applications that integrate with their existing Google Apps accounts. The new education category includes over 20 applications from 19 vendors ranging from learning management systems (LMS) to student tools and teaching aids – all of which integrate with Google Apps for Education. Each app can be accessed through single sign-on and the Google universal navigation bar and many offer deeper integrations that synchronize with Google Calendar and Documents. This new education category will make it easier for schools to have more web apps at their fingertips, including popular existing apps such as Aviary, Grockit, and LearnBoost as well as the new apps launching today. Haiku: an LMS that allows teachers to create media-rich class websites, give and auto-grade assessments, annotate assignments and interact online with students. LearnBoost: an all-in-one gradebook and lesson plan software for teachers that includes tools to visualize data and student performance. And other classroom management tools such as eduARC, Class.io, PlanbookEdu, ThinkWave SIS and Applane SIS, gradebooks such as Engrade and ThinkWave Gradebook, and assessment tools such as EduBrite and RCampus iRubric. BrainPOP: an app that offers animated, curriculum-based content that enhances student learning in numerous ways, from illustrating complex concepts to reviewing before a test. DreamBox: a tool that helps students learn math through interactive lessons and gives teachers reporting dashboards to monitor individual student progress. And other teaching aids like Grockit, BuzzMath and LearnThatWord. EasyBib: an automatic bibliography composer that helps students format sources quickly and accurately to cite in papers. Digication: an online e-Portfolio creation tool that helps students share and showcase their work and achievements online. And other student and admin tools like Aviary, Edutone Sakai Connector, Edutone Moodle Connector, Leveled Library and Rcampus e-Portfolio. Thousands of universities, colleges and K-12 schools around the world with over 10 million users already deploy Google Apps in their classrooms. The applications we're introducing today into the new Marketplace education category are just the beginning. We look forward to expanding and strengthening our offerings as we continue to add new education tools, including web applications by Blackboard, Knewton and the Khan Academy already on the way. To learn more about the education category of the Apps Marketplace – and hear directly from the developers of these applications – register to attend live Google webinars and Q&A on Wednesday, February 2nd. The education technology space has seen an explosion of new offerings in the past few years. What has been missing is a centralized platform for schools and universities to easily evaluate and utilize web apps. Today we are excited to launch an education category in the Google Apps Marketplace designed specifically to help schools and universities easily discover and deploy new web applications that integrate with their existing Google Apps accounts. offer unprecedented flexibility and deliver constant innovation, with new products and updates introduced instantly and seamlessly to all users. That’s why Specsavers, the world’s largest privately owned chain of opticians, decided to switch to Google Apps for 2,500 employees worldwide. Specsavers is currently rolling out Google Apps to head office staff in Australia and New Zealand. The roll out to the remaining head office, laboratory and manufacturing operations in the UK, Nordics and Netherlands will be completed in the first half of 2011. Ancoris, a UK based Google Enterprise Reseller and specialist provider of cloud computing and enterprise security solutions, assisted Specsavers with its evaluation of Google Apps versus Microsoft Exchange and helped the company make the switch. As cloud computing has become mainstream and the demand for Google Apps accelerates, working with professional and skilled partners continues to be key to growth. To remain competitive, businesses of all sizes need to grow and evolve quickly. Web based solutions such as Google Apps for Business offer unprecedented flexibility and deliver constant innovation, with new products and updates introduced instantly and seamlessly to all users. Google Chrome, whose users have tripled in the past year to 120 million, has new IT administrator controls to easily configure and deploy the browser on Windows, Mac, and Linux according to business requirements. Chrome OS is a new operating system that is built and optimized for the web to make computers faster, much simpler and fundamentally more secure. The speed of innovation on the web is amazing, and Google’s Chrome and Apps products capitalize on this speed to bring new productivity and security benefits to businesses. Join us for a live webcast where you’ll hear directly from Google’s Chrome Product Managers Glenn Wilson and Cyrus Mistry on how Chrome and Chrome OS are innovating for Apps for Business. You’ll learn about the latest features and business customer experiences. Plus, a live Q&A will follow the discussion. about the reliability of Gmail, so we thought we'd share some changes to our Google Apps service level agreement (SLA) and some new data. We're pleased to make a couple changes that improve our SLA for our customers. Unlike most providers, we don't plan for our users to be down, even when we're upgrading our services or maintaining our systems. For that reason, we're removing the SLA clause that allows for scheduled downtime. Going forward, all downtime will be counted and applied towards the customer's SLA. We are the first major cloud provider to eliminate maintenance windows from their service level agreement. We're also amending our SLA so that any intermittent downtime is counted. Previously, a period of less than ten minutes was not included. We believe any instance that causes our users to experience downtime should be avoided -- period. In 2010, Gmail was available 99.984 percent of the time, for both business and consumer users. 99.984 percent translates to seven minutes of downtime per month over the last year. That seven-minute average represents the accumulation of small delays of a few seconds, and most people experienced no issues at all. For those few who were disrupted for a longer period of time, we're very sorry, and Google Apps for Business customers received compensation where appropriate. We're particularly pleased with this level of reliability since it was accomplished without any planned downtime while launching 30 new features and adding tens of millions of active users. Fortunately Microsoft Exchange® customers can still benefit from the reliability of Gmail with Google Message Continuity. Comparable data for Microsoft BPOS® is unavailable, though their service notifications show 113 incidents in 2010: 74 unplanned outages, and 33 days with planned downtime. Email is much more complex than your home phone, so making it as reliable as the dial tone is no mean feat. Despite our best efforts, we will have outages in the future. But we're proud of our track record so far and we're working hard to make it even better. Every time you reach for your phone you expect it to work. And we believe that is a worthwhile benchmark. Update: clarification added to fifth paragraph. People expect email to be as reliable as their phone's dial tone, and our goal is to deliver that kind of always-on availability with our applications. It's been a couple years since we blogged about the reliability of Gmail, so we thought we'd share some changes to our Google Apps service level agreement (SLA) and some new data. 's BIG Show. Visit us at Booth #3239 from January 10-13 where you’ll be able to speak with the Google Commerce Search and Google Product Search teams, and learn how our commerce offerings can help bring visitors to your site, optimize their experience, and convert them into loyal customers. (DKIM) to help validate outbound mail with digital signatures. On the inbound side, to help our users identify email from verified senders, in 2008 we worked with eBay and PayPal to authenticate their mail with DKIM and block all unsigned messages purportedly from those companies destined for Gmail users. But the spam and phishing epidemics aren’t letting up – every day Gmail filters out billions of unwanted messages from our users’ inboxes – so we’ve been focused on creating helpful tools and working with the email industry to bring solutions that will help our customers. Email authentication is an important mechanism to verify senders’ identities, giving users a tool to recognize potential spam messages. In addition, many mail systems can display whether a received message is DKIM-verified, which helps spam filters verify and assess the overall reputation of the sender’s domain: messages from untrusted senders are treated more skeptically than those from good senders. Today, we mark another notch in the spam-fighting belt: we’re making it possible for all Google Apps customers to sign their outgoing messages with DKIM, so their sent mail is less likely to get caught up in recipients’ spam filters. Google Apps is the first major email platform – including on-premises providers – to offer simple DKIM signing at no extra cost. Once again, the power of the cloud has made it possible for us to bring this feature to millions of customers quickly and affordably. “We help the most-phished brands on the Internet manage their mail authentication programs, and the Google Apps solution is the simplest that we've encountered. Configuring DKIM for in-house systems requires plug-ins or additional gateway servers, making a company's mail environment more complex and difficult to manage. As a Google Apps customer, this feature took us only a few clicks in the control panel and an update of our DNS," said Kelly Wanser, CEO of eCert, an industry leader in providing critical protection against email fraud. Starting today, all Google Apps administrators can enable DKIM signing in the “Advanced Tools” tab of the control panel. As more email providers around the world support DKIM signing, spam fighters will have an even more reliable signal to separate unwanted mail from good mail. 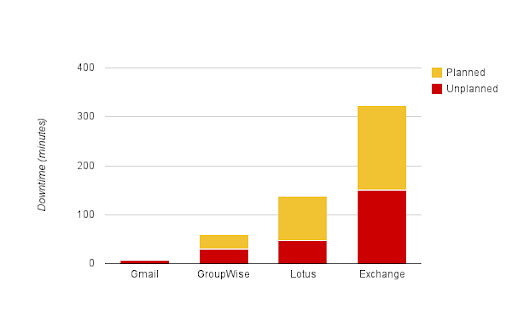 We’re pleased to let millions more organizations use DKIM with this improvement. Google has been an early and consistent supporter of email authentication technologies, which help ensure senders are who they say they are, and in turn help to curb spam. Since we launched Gmail in 2004, we have supported email-signing standards such as DomainKeys and DomainKeys Identified Mail (DKIM) to help validate outbound mail with digital signatures. On the inbound side, to help our users identify email from verified senders, in 2008 we worked with eBay and PayPal to authenticate their mail with DKIM and block all unsigned messages purportedly from those companies destined for Gmail users.
. Today we’ll hear from Justin Ziegler, CIO of PriceMinister.com. To learn more about other organizations that have gone Google and share your story, visit our community map or test drive life in the cloud with the Go Google cloud calculator. PriceMinister.com is one of France’s leading online shopping destinations, connecting over 13 million buyers and sellers in Europe. As a company, we are in constant evolution, both in terms of adapting to the fast paced, and highly competitive industry that e-commerce has become and accommodating our ever-growing number of employees. In terms of technical resources, this represents a regular growth in costs -- each extra work station requiring new software licenses and additional storage. The transfer of existing email accounts to Gmail was successfully carried out and 200 employees quickly came to appreciate the possibilities offered by this new system. The simplicity of Google Calendar, the fluidity of the exchanges enabled by Google Docs, and the accessibility from mobile platforms has dramatically increased team productivity. Editor’s note: Over 3 million businesses have adopted Google Apps. Today we’ll hear from Justin Ziegler, CIO of PriceMinister.com. To learn more about other organizations that have gone Google and share your story, visit our community map or test drive life in the cloud with the Go Google cloud calculator.